write, does not speak English. Solomon and Hannah Weiss' children. Solomon Weiss 64 (head); (b abt 1855) immigrated 1898. naturalized 1903[5?]. b Austria; Yiddish; fath b Austria; moth b Austria; tailor clothing factory; home owned. Anna Weiss 63 (wife); (b abt 1857) immigrated 1890, naturalized 1905. b Austria; AYiddish; fath b Austria; moth b Austria; housekeeper Esther Weiss 38 (dau); immigrated 1890, naturalized 1905. b Austria; Yiddish; fath b ustria; moth b Austria. Irving Weiss 25 (son) [ aka Isadore] b NY (abt 1895); fath b Austria; moth b Austria; salesman silk company. Barnett Weiss [aka Barney, Barnard] 22 (son) b NY (abt 1898); fath b Austria; moth b Austria; salesman, clothing co.
Sidney Weiss 20 (son) b NY (abt 1900); fath b Austria; moth b Austria; shipping clerk fur co.
Malclon Weiss 16 (grandson) b NY (abt 1904); fath b Austria; moth b Austria. |Minnie Weiss 5 (granddaughter) b NY (correction: born in Worcester, MA, by MAS) (February 25, 1914); fath b Austria; mother b Russia. 1930 Census. Manhatten, NY, NY. Year: 1875; Married 25 years. (as father) b. Austria per Sadie Bergold 1930 census. 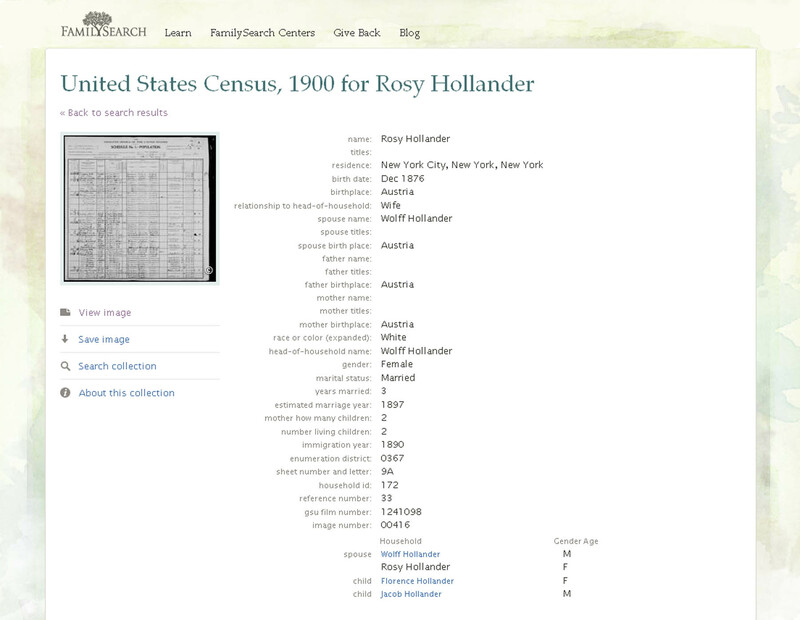 U.S. Naturalization Record Indexes, 1791-1992. Record for Solomon Weiss. US Dist Court Brooklyn NY. Aug 1858; Arrived NY, NY, 12-15-1889. Solomon married Louisa (Hannah Leibe) in 1875. Louisa was born in Mar 1857 in Austria. She died in prob, NY. b. Austria per Sadie Bergold 1930 census. 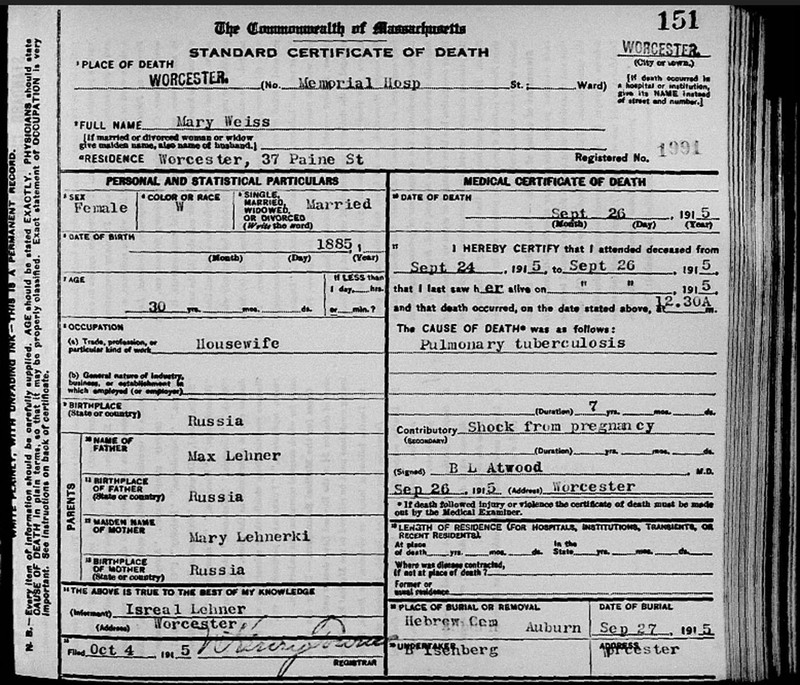 Born (pc): December, 1876 ? Jack Hollander, raised by Leibe Hanah Bender Weiss when mother Rose died. 2 F i. (Lena) Lillian "Lilly" Weiss . Lillian Weiss married Max Lefkowitz. Their Children: Ruth and Mirium. Ruth married Myron "Mike" Bank, Ruth and Myron's children are: sons Harvey, David and daughter Nancy. 3 F ii. Ester Weiss was born in Nov 1879 in Austria. 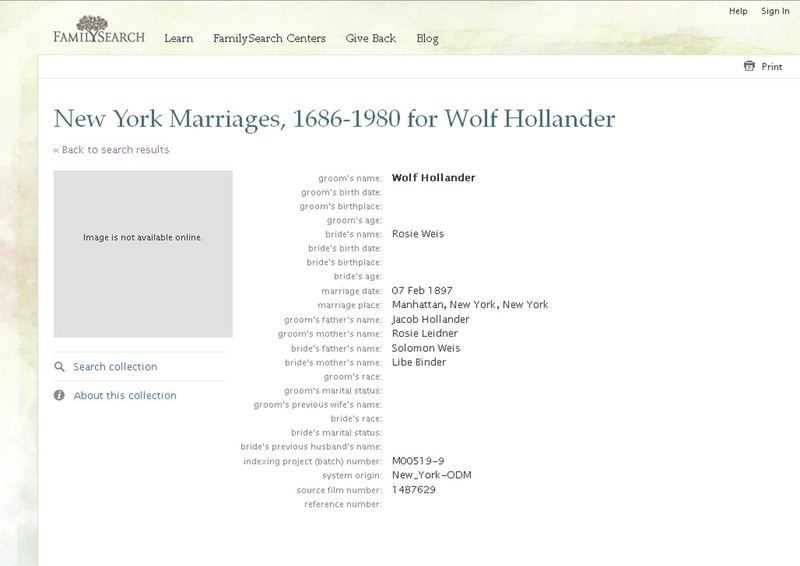 Harry's wife was Mary Leonard (or Lehner). They had one child: Minnie (later Shelly Weiss Stecker). Harry Bernard Weiss death: Died on March 2, 1954 in Beaumont, Texas (Jefferson County) of carcinoma of the stomach. Cremated. 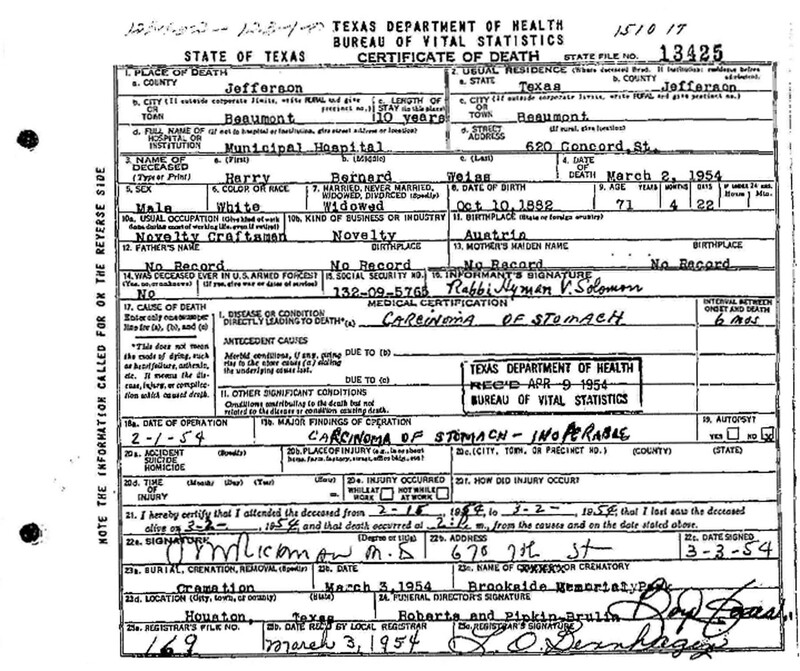 Birth date on Death Certificate was October 10, 1882. 5 M iv. David Weiss was born in Apr 1884 in Austria. + 6 F v. Sarah (Sadie) Weiss was born on 16 Mar 1886. She died in Jul 1971. 7 F vi. Sarah Weiss was born in Mar 1886 in Austria. Most likely this is the same as Sadie Weiss (add: MAS). 8 F vii. (Lena) Lillian Weiss was born in Jun 1887 in Austria. 9 M viii. Joseph Weiss was born in Jul 1891 in NY. 10 M ix. Isador (Isidor, aka: Irving) Weiss was born in Jan 1894 in NY. 11 M x. Aaron Weiss was born in Feb 1896 in NY. He died in Los Angles, CA. 12 M xi. Barney Weiss was born in Jan 1898 in NY. Barney married Sarah . Sarah was born estimated 1890/1900. 13 M xii. Sydney Weiss was born in Feb 1900 in NY. 4. 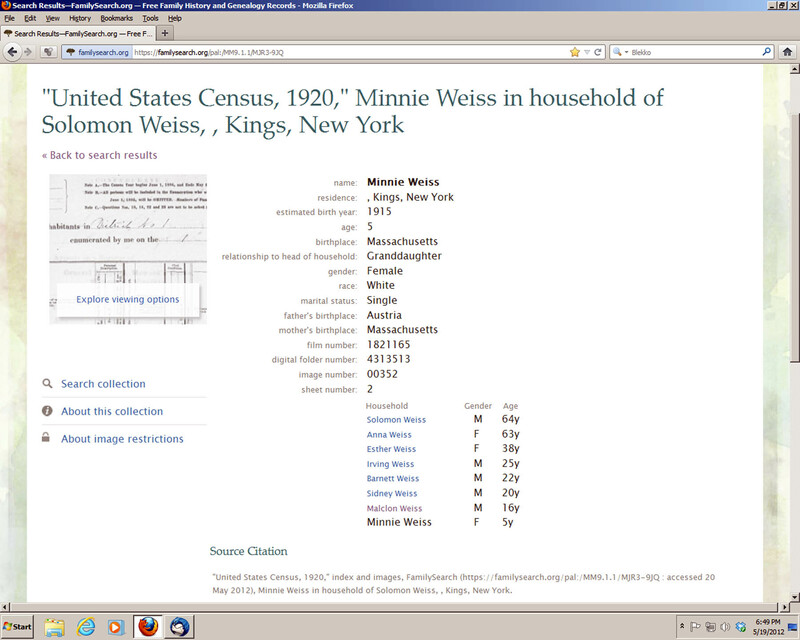 Harry Weiss (son of Solomon) Weiss was born in Dec 1881 in Austria. 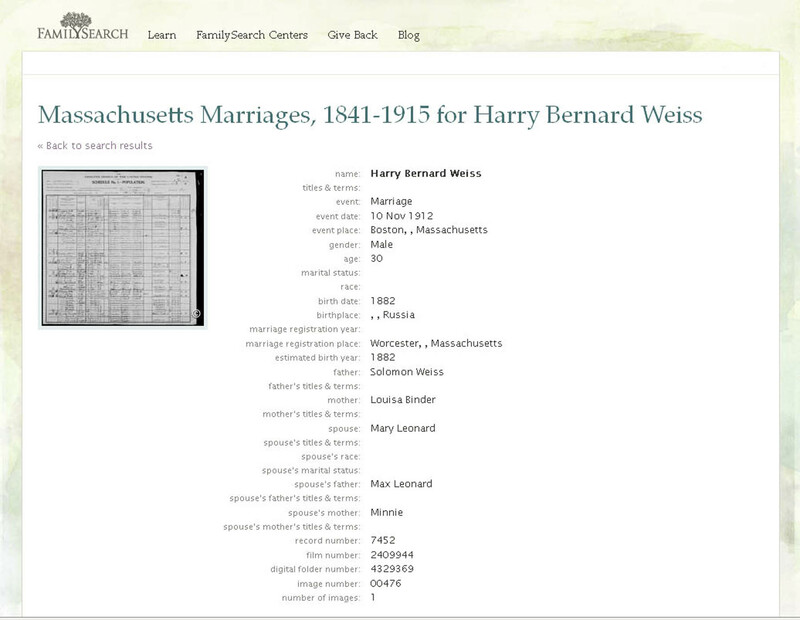 Harry married Mary Leonard (or Lehner) on November 10, 1912 in Massachusetts. Mary died September 26, 1915. + 14 F i. Minnie "Shelly" Weiss was born February 25,1914. She died on 12 Dec 1982 in Chula Vista, CA (near San Diego). Mary was also pregnant when she died in 1915. 6. Sadie (Sarah) Weiss (daughter of Solomon Weiss) was born on 16 Mar 1886 in Austria. She died in Jul 1971 in pos, Bronx, Bronx, NY. Sadie married Frank J Bergold son of Bergold and mother about 1907. Frank was born on 15 Sep 1882 in NY. He died in May 1965 in pos, NY. 1930 Census. NY, Kings Co, Brooklyn, Dist 36; 134 Keap Street St.
father b NY; mother b Germany. Occupation: Inspector Industry Drugs. b Austria; mother b Austria. Immigrated 1889. Henry bergold; son; age 9 [b 1921? ]; single; b NY; father b NY; mother b Austria. + 15 M i. Henry Bergold was born on 1 Apr 1921. He died in May 1985. + 16 F ii. Minnie "Shelly" Weiss is printed as #14 on page 4. 14. Minnie "Shelly" Weiss (Harry, Solomon) was born Feb. 25, 1914 in Worcester, MA. She died on 12 Dec 1982 in Chula Vista, CA. Minnie Weiss' mother was Mary Leonard (or Lehner), who died when Minnie was young. Minnie changed her name "Shelly" Weiss as an adult. Minnie married Samuel Stecker, becoming Shelly Stecker. Minnie married Samuel L. Stecker (changed from Stecher), son of Marcus Stecher and Sadie Albert before 1938. Samuel was born about 1903 in New York, NY. 15. Henry Bergold (Sadie Weiss, Solomon) was born on 1 Apr 1921 in NY. He died in May 1985 in Bergen, NJ. developed pictures of bombing damage fo intellignce in pacific. had a stroke. Henry married Helen Rodnon daughter of Rodnon and lupka. Helen was born estimated 22 Oct 1921. She died estimated 21 Jan 2002. Laurel Bergold, Dorothy Bergold, Linda Bergold, Peter Bergold.